The long-range reconnaissance version of the Do 17M with Bramo engines. The L version would not be able to enter production with the DB 600 owing to its use in the Bf 109, and the Bramo engine was rather thirsty on fuel and left the M models with too short a range for reconnaissance use. BMW 132N radials of 865 PS were selected instead, which had lower fuel consumption for better range. Another two prototypes with DB 600 engines were produced as the Do 17R-0, but did not enter production. During reconnaissance missions the P-1 was armed with four MG 15s in the A, B and C—Stands. One machine gun was located in the rear of the cockpit, another in the lower rear Bola mount, one facing forward through the windshield and the other in the nose glazing. In earlier variants the B-Stand (the gun position in the upper rear cockpit) was open to the elements, but the P-1 now provided a enclosed bulb shaped mount protecting the radio operator from the weather. The P variant had similar features to the Do 17M-1, with added blind flying and camera equipment for reconnaissance work. The Do 17P was powered by two Bramo 132 N radial engines with a maximum performance of 865 PS (853 hp, 636 kW) each. The machine was fitted with several radio variations. The FuG IIIaU radio (Funkgerät), the PeilG V direction finder (PeilG - Peilgerät) and the FuBI 1 radio blind-landing device (FuBI - Funkblindlandegerät). The crew of three communicated with each other via the EiV intercom (EiV -Eigenverständigungsanlage). The P-1 was equipped with either Rb 20/30 and Rb 50/30 or Rb 20/18 and Rb 50/18 cameras. The P-1/trop was fitted with filters and protection for the cameras. The cameras were controlled remotely by the crew from the cockpit. Due to a shortage of night fighters, at least one Do 17P-1 was assigned to this role. A smooth metal sheet was installed in place of its glass nose and it was armed with three 20 mm (0.79 in) MG 151/20 cannons. The machine operated under Luftflotte 1. The Do 17P-2 was identical to the P-1, with the additional installation of an ETC 500 bomb rack under the fuselage. These aircraft were designed for night reconnaissance. 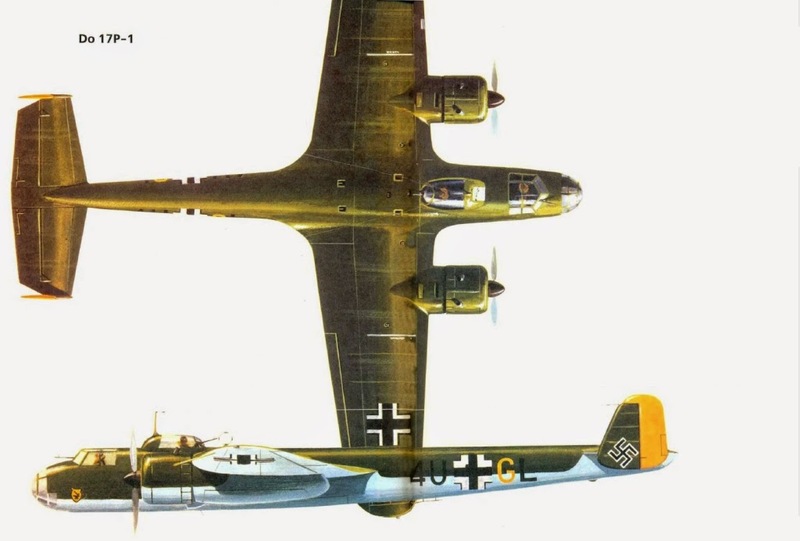 It is assumed that Dornier converted most, if not all, P-2 models from existing P-1 production aircraft.